Watching the setting summer sun from 30,000 feet is a unique experience. The horizon is a bright bar of orange and yellow light, fading into various shades of blue up into a sky almost absent of stars. The sunset is reflected by hundreds of tiny jewel-like ponds scattered below, reflecting the sunset in countless unique shapes. It doesn’t seem like 3am but above Alaska, in June, the summer solstice is only a week away- this is the land of the midnight sun. I picked up my checked duffel bag of gear, and retreated to a unoccupied airport corner next to the Starbucks kiosk, where I spent the night more than once during my Big Year. “This time I returned to Alaska much wiser” I thought to myself as I assembled my lightweight camping cot and spread out my sleeping bag on it. This sure beat sleeping on the cold hard tile floors. Minutes later, I was asleep and the next 5 hours passed by quickly. Getting adjusted to this 3am sleep schedule was an important part of my Nome birding adventure, where the most beautiful light happens after 10pm and many birds continue to be active during the bright summer night. I planned to stay up late and take advantage of this, then go to bed and sleep late. In the morning, I met my first travel companion as he arrived on his overnight flight from Chicago. Jeremy and I met during my Big Year, and we’ve been friends ever since. I’ve birded with him in Ohio, Texas, Arizona, and California, and we have enjoyed many birds, amazing views, and good food while traveling together. He and I hung out as we waited for our other two birding buddies to arrive. Before long, Alex and Brandon showed up, towing large backpacking packs with camping gear, food, and optics. We went through security and headed to our gate, where we were greeted by some familiar faces. Tom Johnson and Cory Gregory, two skilled bird guides were taking a group out to Nome on the same flight. Richard Benneville, Nome’s mayor and the friendliest man on the Seward Peninsula was also there, remembering me and greeting me with a smile. Richard was a tour guide for many years, and I’ve gone on trips with him in the past- he’s a riot and I’m grateful to call him a friend. We joked about bird names and the Pied Wheatear Alex found last year, which Richard definitely was aware of- along with the boom of birders it brought to Nome! Our flight was delayed, but we got underway a few hours later. I sat next to a few college Bio majors from Hawaii on the flight out, who were en route to study Golden Plovers with their professor. Talking about birds made the flight go by rather quickly, and before I knew it we had landed in Nome. After retrieving the rental truck, we headed out to do some evening birding. We drove out towards Safety Sound on the Nome-Council road. Land of the Midnight Sun: A full 21 hours of daylight! During the trip we stopped at the Safety Roadhouse to warm up by the wood stove and grab some food. This is a really unique place and worth a visit. Notice all the dollars on the wall? I drew one with a yellow-billed loon on it; look for it the next time you’re in Nome in the entry way to the building. We drove up towards the town of Council to find an active Gyrfalcon nest under a bridge. There was only one chick, and despite the temptation to get closer- we kept our distance and took photos from over 100m away. After a successful Gyrfalcon sighting, we headed back towards town and looked unsuccessfully for the Lesser Sand-Plover around some different river estuaries. Despite this miss, we had great looks at Golden-Plovers and Bar-tailed Godwit. It was after midnight but we kept going since we are all excited and eager to find more birds. Our next “target bird” was the Bristle-thighed Curlew, which we were going to search for the following day. Despite having over 20 hours of daylight, we needed our sleep and set up camp along the beautiful Salmon Lake at the areas only designated campground along the Kugarok Road heading north out of Nome. In the fading daylight, we set up camp and fell asleep before we knew it. The following morning we explored along the 86-mile long Kugarok Road. Stopping to find Bluethroat, and other tundra birds along the way made it an enjoyable drive. 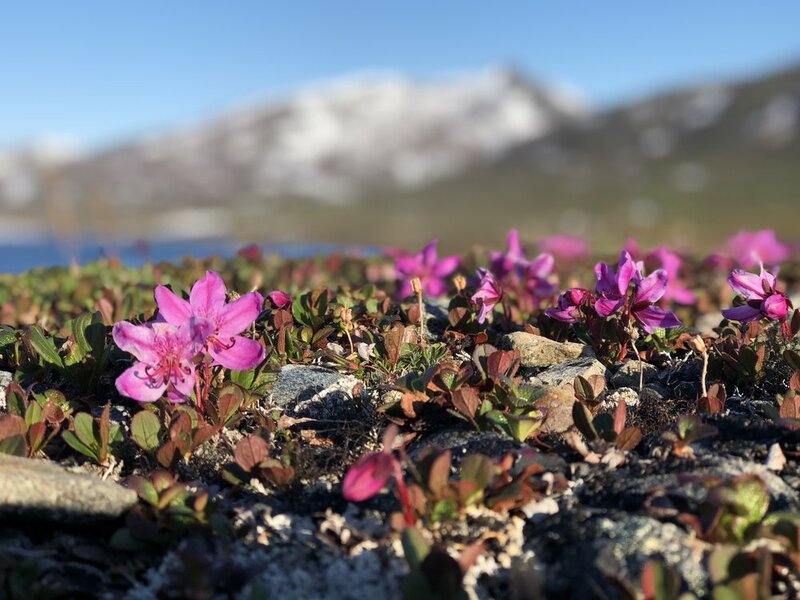 I especially was fascinated with the tundra wildflowers. We stopped along the roadside searching for Quiviut- the dense underfur from Musk Ox, which they shed in the summer by trampling willow bushes and rub it off. These warm fibers are used for spinning into wool that is knit into hats and scarves. I collected a bit, and hope to have enough for a future watchmans cap. Stay tuned for the next post which will highlight the remainder of our trip!